Ram says OCM has seen more interest in its reverse auction site, which is a broking platform. OceanConnect Marine (OCM) is a familiar name to many in the industry, but seems to hold the dubious honour of being one of today's more misunderstood players - a fact OCM's Ethan Ram, Chief Operating Officer, is well aware of. "Some people see us as part of Chemoil, or as a dot com company, and don't realise that we're actually a diverse, stand-alone marine fuel business within Glencore, with substantial broking, trading, and physical operations across the globe," says Ram, who recently talked to Ship & Bunker about the company's past, present, and future. "We are one of the world's largest marine fuel traders and brokers. Many people are surprised to learn that in some of the largest bunker ports in the world, such as Fujairah, we are the largest buyer as a broker or trader. We have been a physical supplier in Malaysia and the U.K. for several years, and we have a healthy cargo trading business. "So there really is a lot more to OCM than I think many people are aware. "When Chemoil acquired OceanConnect's marine fuels business I think there was misunderstanding as to how the two companies interacted and the market didn't fully understand that OceanConnect would remain a stand-alone business within a larger group." OCM started life in 2000 as OceanConnect, a joint venture between BP, Shell, and the at-the-time Fuel and Marine Marketing (FAMM), a joint venture between Chevron and Texaco. Notable growth points in the early years were the 2002 additions of Bunkerfuels' Korea team and H. Clarkson's bunker brokerage team, and the 2003 acquisition of UK-based Marine Oil Trading Ltd. 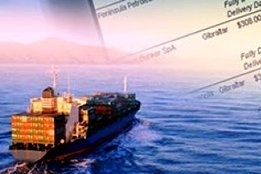 In 2011 physical supply giant Chemoil Energy bought OceanConnect's bunker supply and brokerage business, establishing OceanConnect Marine as a stand-alone business within the Chemoil Group. Mining and commodities trading giant Glencore then acquired Chemoil, and OCM became a stand-alone business within Glencore's Oil group. OCM's principal marketing offices are located in Stamford, London, Singapore, and Seoul, along with satellite offices in Tokyo, Dubai, Seattle, and Hull in the UK. "Our mandate from Glencore is to do what we have been doing, that is, to grow our back-to-back trading and broking activities, and to invest in physical supply and cargo opportunities in markets where our strong capital resources and market insight add value," says Ram. One thing that Ram stresses is that OCM are very much separate from Chemoil. "We have separate management teams and reporting lines, separate IT systems, separate credit lines, separate front and back offices. Everywhere in the world we operate at arm's length from Chemoil," he says. "This means, for example, in ports where Chemoil is physical we cover them like any other supplier. "Today, Chemoil accounts for around five percent of our overall supply." Another point stressed by Ram is OCM's strength in its people. "We are a relatively small company by headcount, but we pull above our weight because our traders and brokers are highly talented and customer focused. Take our brokerage business. Broking is based on providing top notch service, consistent and reliable information. Our comparatively small team handles several million tonnes a year, and it's no accident they have been servicing some of the most demanding vessel operators, such as oil majors and national oil companies, for decades. Broking is a vital part of our business because it reflects our company's culture and values." After the shock 2014 collapse of OW Bunker, many in the industry predicted traders would fall from favour, and turn instead once again to brokers. But Ram says that while there has been much discussion over moving away from traders, his experience suggests that, in practice, little has changed. We saw an uptick in our brokered activity, but it certainly was not the 'year of the broker' as some had predicted. "Our B2B trading business is a strong as ever, serves several hundred customers, and today amounts to about 60 percent of total volume," he says. "For example, in 2015 we became one of the largest traders in the Russian Far East, an area where in prior years our exposure was more modest. "There has been more scrutiny of our financial health by suppliers and customers alike, but post OW we haven't seen much change. We welcome the scrutiny, and have found that once our counterparties understand the capital strength of the Glencore group, they are pleased to resume business and maintain our credit lines. We don't assign our receivables, and that makes customers comfortable there's no risk of double payment. "We saw an uptick in our brokered activity, but it certainly was not the 'year of the broker' as some had predicted." One area where Ram says OCM has seen more interest though, is in its reverse auction site, which is a broking platform. Ram describes it as the "Ebay for marine fuels," where suppliers compete in a scheduled 10-minute auction to win a customer's business. A "reverse" auction is different from a conventional auction only in that instead of the price increasing as buyers bid, the price drops as suppliers compete to win the auction. "Our platform gives a secure and transparent forum for bunker procurement. Some 1.5 million tonnes per annum are sold through the site" says Ram, adding that it is used by both large and small vessel operators. "Our customers tell us they like using the auction site because it is straight forward and achieves excellent, quantifiable results. And with the push of a button there's an audit trail that demonstrates the fuel was purchased through a competitive process." Looking ahead, 2016 looks almost certain to continue to be plagued with chronically low oil and commodity prices. While the threat to industry giants such as OCM parent Glencore have been extensively speculated on in the media, Ram says that there has been no impact on OCM's business. "A few suppliers temporarily reduced our credit lines, but once they understood our financial strength, they restored the lines to prior levels. In Glencore's most recent public filing, the company reported liquidity of more than $13 billion, and Ram says they have been extremely supportive of OCM's business with funding and quick decisions on projects. "Our access to capital is through Glencore's Treasury. Basically, they are our bank. This means we have access to substantial liquidity and it also means that, unlike most traders, we do not have to assign our receivables. The only covenant is that we need to make an acceptable return on the capital we deploy," he said.